Louise the hippo in her improved habitat. 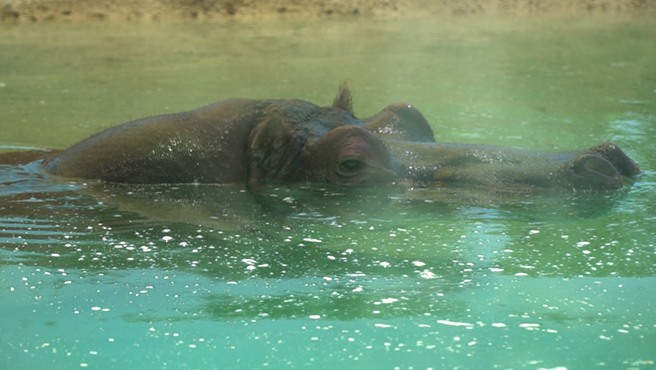 HONOLULU – The Honolulu Zoo is happy to announce that Louise the hippopotamus was returned to her improved habitat on Tuesday, April 2, and is doing extremely well in her upgraded digs! After the completion of a $3.5 million capital improvement project, the hippo habitat now features an upgraded barn and a filtration system that cycles the 40,000-gallon hippo pond every 20 minutes. The new filtration system can handle hundreds of pounds of waste every day, keeping the water clean for Louise to enjoy and for visitors to see her more clearly. Louise the hippo, 27, came to the Honolulu Zoo in 1992 from the Denver Zoological Gardens. Hippos are semi-aquatic vegetarians, eating as much as 80 pounds or more of grass every day in the wild. They generally live well into their 40s.